In this thread I will share anything cool history relating to awdal and ifat and maybe early islam in Somalia here. Call me Somali Scholar This thread is intended to educate somali people over how Islam came to somalis and how it spread. And to increase our knowledge over our homeland contribute away. 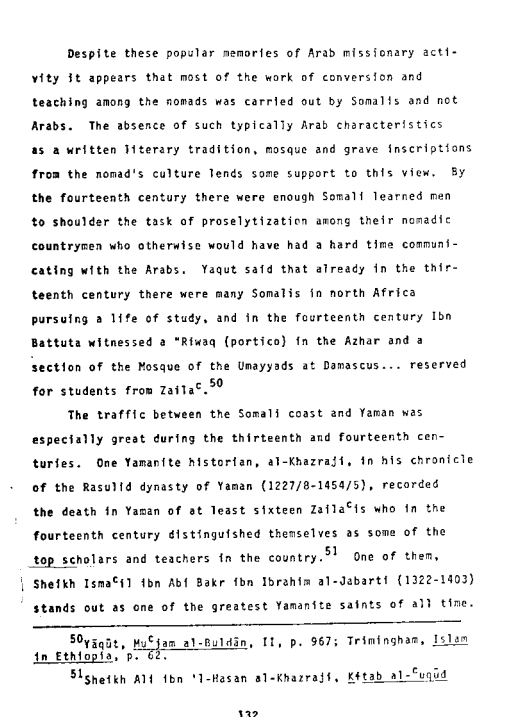 I was currently reading a thesis from 1977 written for the uni of California by a somali student i think for the government lol There is a lot of arab bias ( i think that was intentional lol ) but also some really interesting somali stuff Here's some cool stuff from that. Zaylici scholars as the top scholars in Yemen!!! This fits with Somali Oral tradition that says Zaylici scholors help spread deen to yemen!! I heard that growing up wallahi. No one wants to talk about Somalis and how we contributed to the spread of Islam. I want to challenge that with this thread. The "Somali" confederation? Anyone that's a Somali speaker? but I believe the Samaale people are thousands of years old. Last edited by Caesar on Sat Jul 26, 2014 1:15 am, edited 1 time in total. Samaale is a made up political alliance not a real name and it's not even in history no qabiil mentioned samaale even as recent as the British, and Italians. Famous travelers called the people of the present day horn Berbers. Somali is made up of two words soo and maal which means go milk in reference to our love of caano geel. f you want to talk about confederacies go make another thread detailing that. discuss the topic or leave my thread. I doubt Snet knew of Zaylicis students studying in Syria or Spreading the deen to ARABS!!! There is somali oral tradition of shiekhs going to Yemen ( at least in my area) and establishing masjids and converting people to Islam. This source sheds some light on that to non believers of somalis in islamic history. Any thoughts snet? Or will you live in 1990 revisionism??? Zaylicis were muslim before most of the world and most of arabia yet somalis claim islam came by a shiekh having kids. I plan to debate that argument with facts. Last edited by Caesar on Sat Jul 26, 2014 3:46 am, edited 2 times in total. Was just correcting you breh, don't make me mad tho cuz I will go ham on you considering I just ate a whole saxan of djiboutian cambuulo. Zayla'i traveled extensively throughout the Muslim world during his lifetime. He eventually settled in Cairo, Egypt, where he joined other Somali students at the Riwaq al Zayla'i of the Al Azhar University. Uthman wrote several books on Islamic jurisprudence, one of which is considered to be the single most authoritative text on the Hanafi school of Islam. Consisting of four volumes, it is known as the Tabayin al-Haqa’iq li Sharh Kanz al-Daqa’iq. Ismail Ibrahim Al Jabarti was the father of Abdirahman "Daar-ood" the progenitor of the Daarood clan. His son sheikh Abdirahman (AUN) spread Islam to the Somali clans living in North-eastern Somalia around Sanaag and Bari today. So it was built during the time Prophet Muhammed PBUH was told to face Mecca instead of Jerusalem. Hence it is the oldest outside of arabia. According to the traditional Muslim view, the Qiblah originally faced the Noble Sanctuary in Jerusalem. This Qiblah was used for over 13 years, from 610 CE until 623 CE. Seventeen months after the Islamic prophet Muhammad's 622 CE arrival in Medina – the date is given as 11 February 624 – the Qiblah became oriented towards the Kaaba in Mecca. stop trolling, this is thread is about islam and somali history. if you want to discuss other things go make another thread. I was just correcting you on something you said in your previous post. Go ahead with your thread breh but I will come back if you lie about history again. Somali and The Notion of being cool and Gangsta? What Somali city name sounds cool to you?